Located on Owls Head Harbor, this thoughtfully constructed home overlooks some of the best views in the Midcoast. The Mussel Ridge Channel passes right in front of the house, which is a major traffic lane for boats, allowing ample opportunities to watch various maritime activities. Access to the water is down a short mowed path. The water access is rocky, but okay for launching kayaks. Designed and built with renting in mind, this house has many wonderful features for the vacationer. Almost all of the rooms in the house have water views and enjoy fresh, comfortable furnishings and decor. Enjoy sitting outside on the deck or in the screened porch or on a chilly night sit by the fireplace. BEACH CLASSIFICATION: We have categorized this property as having or being near a sandy beach. More specifically for this property - it is a short 5 minute drive to three great area beaches. The closest is Crescent Beach, but also Birch Point Beach State Park and Crocketts Beach are other public beaches within 5 minutes of the property. You can walk a 1/2 mile to Owls Head State Park Lighthouse where there are some small beaches as well. 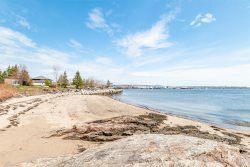 There is not an actual usable sandy beach at this property, but the nearby beaches are great for kids and that is why we have classified it as being on or in this case - "near" sandy beaches. As always, we enjoyed working with Tiffany and everybody at On the Water in Maine. The house and garden are beautiful. We loved the fireplace and the big table in the living room (big enough to hold large board games). Their instructions prior to arrival were very complete and helpful. They tried to be very responsive to problems we encountered. Like the view and the location on the water and near the General Store. We loved the view and proximity ( walking distance) to the lobster docks and the General Store in Owls Head. We like the layout of the house with the two bedrooms and bath and a sitting room upstairs in addition to the downstairs area.We would love to see a bigger more comfortable sofa in the downstairs living room area and the removal of the very large coffee table as it makes it more difficult to enjoy sitting in that area. We love the beautiful antiques and coziness of the property. Working with OTWIM continues to be a breeze because every detail of the rental process has been so thoroughly developed and shared with the renter. This is our 4th stay at Juniper Bank, so obviously we really love this property and it's location. We love the view, especially from the upstairs living room, and look forward each morning to the departing lobsterman in their boats. Well run organization with absolutely no hitches. Just spectacular views,and the firepit is a nice addition since we last visited. The staff is always courteous and responsive. The property is well managed, well kept and updates are made every year. They listen to their guests and do an outstanding job of attending to their needs. Renting through them is efficient, informative and highly organized. They have an outstanding website that is easy to navigate and contains all the information needed to decide on a property to rent. We return to Juniper Bank year after year because the house is large, comfortable and is equipped with all the necessities of modern living. The view of the water, islands and Owls Head harbor is our favorite feature of the house. It is also convenient to Rockland and all the boating, entertainment, restaurants, art galleries, walking trails, etc. the area has to offer. I have been renting properties in Mid Coast Maine for many years through On The Water in Maine. This is a top shelf operation with wonderful rental properties and staff. The check in and check out are quick and easy and they provide great directions to the rental property. Thanks for a seamless vacation. Juniper Banks is a beautiful property with great landscaping, flower gardens and a well built fire pit with plenty of deck and outside seating. There is a mowed path with a rope guide going down to the water where the children searched for sea glass and rocks. It is close to Rockland and numerous restaurants as well as a short walk to the Owls Head Store and Owls Head Light House which we hiked in the early morning with not another person in sight. The living accommodations were spacious and homey with 3 levels,2 separate living rooms, a well equipped kitchen and ocean views from all floors and 2 of the 3 bedrooms. We look forward to returning next year. Small company that remembers people from previous stays. Great house. This was our 2nd visit and we enjoyed it very much. The netflix was a great thing to have. We would be back again next year, but my wife is a painter and has painted out all the vew from this property. I would recomend this house to anyone. Working with OTWIM continues to be a no-lose experience because of how well the whole process, from e-checks to check-in, has been perfected. We love the view out over the water to Monroe Island, whether from the deck or the upstairs living room and bedroom. Believe it or not, we enjoy hearing the lobster boats moving out, beginning about 4:45 a.m.! Besides being well-appointed, Juniper Bank is ideally situated for many day trips in the mid-coast region. These are the features we like best about the property. This property is ideal for sunrise. There are unobstructed views of the sun from the deck with a beautiful pink and orange sky. The property is quite large, with three living spaces (one on each floor), three bedrooms, two bathrooms and a good size kitchen. The kitchen is also well equipped with little gadgets not found at some other properties. The lawn isn't so idea for sunbathing or running around as it is for meandering, it's quite sloped and the large side is out front. The flowers are lovely though and the fire pit is nice. The house floor plan is a bit odd, with lots of doors since you go around and around in a circle on both floors. The disorientation fades though. I imagine they will work on the sulphur taste of the water, but if not bottled is suggested. Also the yard doesn't have lounge chairs so bringing those would be suggested. Could not have been a more seamless, professional, and overall positive experience. Location, location, location. Owls Head is ideally situated to enjoy both the qualities of the waterfront its mesmerizing maritime activity and exquisite natural scenery and the convenience of proximity to Rockland, with its wonderful restaurants and museums. The agency, On the Water in Maine, Inc., was top notch. Communications were excellent, description of the property we rented was accurate. Everything was efficiently handled and left me with no questions to ask or concerns. All interaction was professional and caring. Juniper Bank was a lovely, well-maintained and furnished home with a pristine view of Penobscot Bay, an island and Owl's Head harbor. Spending time on the deck overlooking all of this was most relaxing and entertaining. On The Water In Maine has thoroughly task-analyzed the process of dealing with clients electronically. It is a pleasure to work with this agency because everything plays out so seamlessly. Juniper Bank is a well-appointed property ideally situated on the mid-coast for day trips to nearby towns or for simply enjoying the property's setting. We probably enjoy most, however, the view of the water and the working and the pleasure boats that travel it. On the Water in Maine is the most customer oriented firm we have ever worked with. They take excellent care of their properties, provide detailed information to tenants and are always available should you have questions or concerns. They make the rental experience easy and enjoyable from start to finish. Juniper Bank sits high above Owls Head Harbor. It provides beautiful views of Penobscot Bay and the sailboats and lobster boats that pass by. The house is spacious and comfortable and is equipped with all the modern features of a year-round home. It is within easy reach of Rockland and the many things mid-coast Maine has to offer. We love making Juniper Bank our home for a month every summer. We have rented from your company all 3 of our trips to Maine. Your personalized service ensures that we will use your agency for as next vacation in Mane. This was an awesome property! We loved the views from the deck as well as the flower gardens! The house was perfect in every way! Agency, 'On The Water' was very professional and easily available if needed. We totally enjoyed Juniper Bank! We had not stayed in this area of Maine before and we loved it's quiet and private location. House was very comfortable and had everything one would need, so well equipped, neat, clean, spacious and organized. we enjoyed gorgeous sunrises in the morning and had most of our meals at the table and chairs on the back deck overlooking the beautiful water and it was very private! On the Water in Maine was a pleasure to deal with. They were informative and professional. They were quick to take care of any issues we had while we were there for the week. Juniper Bank is a wonderful home to spend some time in. The views of the water are amazing! Every morning my sister and I got up early to watch the sunrise over the water. Just spectacular! The house is spacious and its really nice to have several living areas to enjoy. The kitchen is very well stocked and everything you need for cooking meals is there. The house is located in a quiet residential area and we enjoyed the peace and quiet of the area. Working with OTWIM is so easy because every facet of the rental process has been well thought out. Necessary information is shared to renters in timely emails, so that the renter really knows at all times what needs to be done and when. The view from the house is fantastic, whether sitting on the deck or reading from the upstairs living room or waking up to the sunrise in the bedroom. On the Water in Maine, Inc. makes every step effortless for the renter. Everyone I have worked with is thorough, knowledgeable and polite. The level of detail and transparency that this company provides is really appreciated, there are never any surprises when you get to your vacation property. This property was beautiful inside and out. The house was airy and bright with beautiful views of the water and the extensive gardens. On the Water in Maine is never a disappointment. The description of the cottages have always been accurate and up to date. House was lovely, well appointed and very clean. We did rent kayaks from On the Water in Maine and they delivered them to the house. It was a hike to put the kayaks in the water, but we found ourselves only heading to the water at high tide - which was fine. Carrying a kayak over the rocks can be dicey when the tides are lower. Always professional. I left some of my clothes at an Inn on the way to Maine. They shipped them to On the Water in Maine and they brought the package to me when it arrived. Our 3rd stay at Juniper Bank - We love the view! On the Water in Maine was very easy and pleasant to work with. They were attentive to our needs, responded immediately to questions and kept us informed via email of severe weather alerts as well as traffic issues. The process they use for checking in and out is convenient and hassle free. They had regular email contact with us in the time preceding the rental and provided detailed information on the house and how to make the most of our stay. They are a very professional group that takes its mission seriously in providing quality properties and excellent customer service. 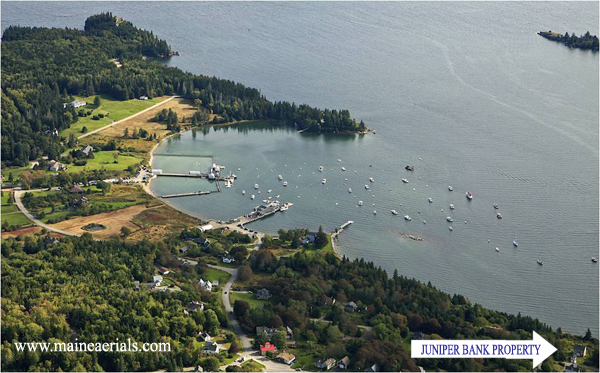 Juniper Bank is located in the heart of Owls Head for ultimate convenience to the mid-coast region and beyond. It has all the modern conveniences, a beautifully landscaped yard and a gorgeous view of Owls Head harbor and Penobscot Bay from the deck. Having two master suites was a plus for us and for our visitors. The basement recreation room was great for teenagers to have a space of their own. This is a very nice rental property with lots to recommend it. We had an absolutely perfect week at Juniper Bank. The lupines were in bloom and every day was clear and sunny. We loved the views from the house - the best of all the rentals we've had - and the easy access to the water was a big plus. We spent hours hunting sea glass as we watched the lobster boats motor to and from Owls Head harbor, just around the bend. The house itself is beautifully decorated and the rooms are bright and sunny. We also enjoyed all of the original artwork on the walls.